We have been outspoken in our critique of Simrad’s Halo radar. We felt that its ability to pick targets out of sea clutter was poor, making it dangerous to rely on. 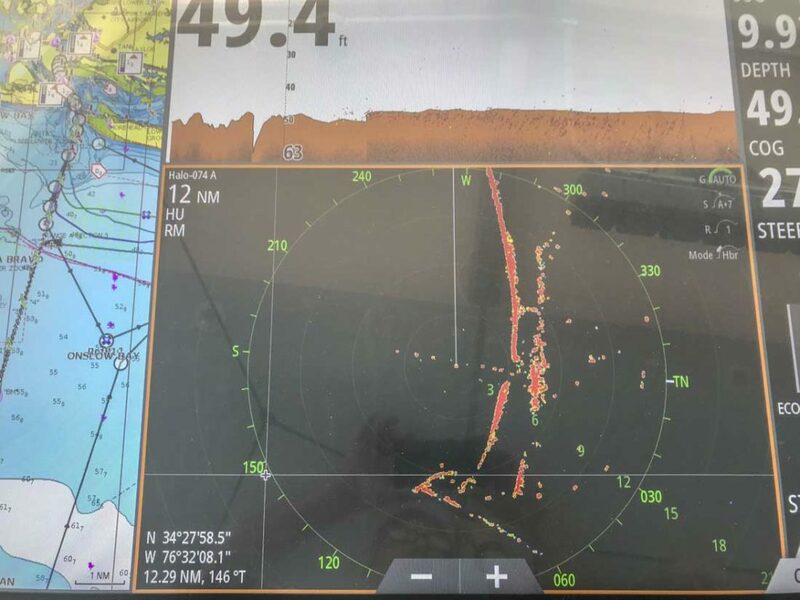 We are pleased to report now that after adding Simrad’s Velocity Track software, our Halo is working very well.The photo above is taken in the Beaufort, NC entrance channel. Seas are four to seven feet. The Halo radar now easily paints the closely spaced entrance buoys, as well as 25-35 foot fishing yachts. 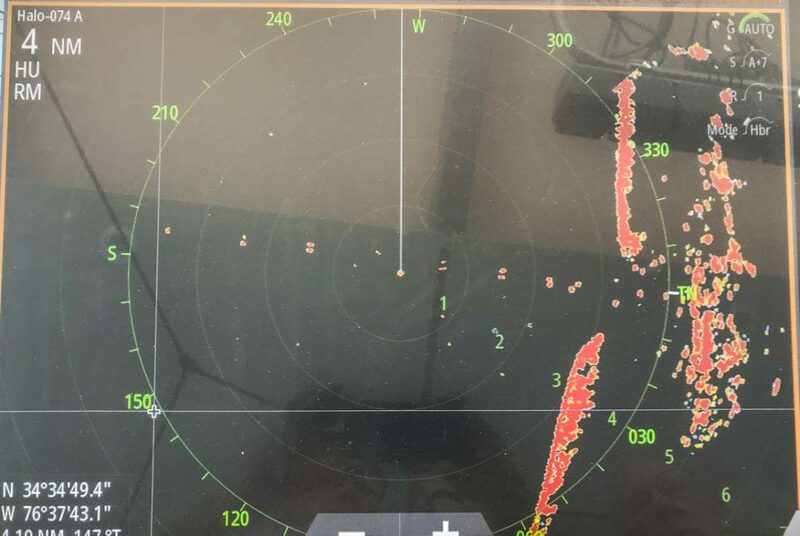 The photo above at four mile range clearly shows separation between closely spaced channel buoys, as well as small yacht targets at the bottom of the screen. This is on full auto. We could do better fiddling with the controls. Cory McMahon of Triton Marine was aboard and feels the Simrad Halo radar is now as good as any yacht radar. He services and/or sells them all, and as our experienced is limited we suggest his opinion should carry more weight. This entry was posted on Saturday, June 30th, 2018 at 12:19 pm and is filed under FPB 78, The Logs. Both comments and pings are currently closed. Good to hear Simrad is getting their act together! I hope you also get a chance to see new Furuno NXT in action. I did a 900nm trip recently in a congested partly inland waterway, and out of literally hundreds boats passed going both ways, NXTs doppler assisted ARPA Auto Target Acquire did not fail to detect one – and all those autodetected targets give automatic TCPA alarms if they pose a risk, no manual fiddling needed. Really impressive technology, makes for ideal watchkeeping radar, especially combined with its relatively low power consumption. Cochise has ten 340 watt panels and six 360 watt panels.The Electrodyne alternators are permanent magnet type.